This week has been a week for cutting and sewing skirts. A couple of them have been custom orders, and the rest are for the booth. This one is for Stacey, and it's all cashmere, in really bold colors. This one is Winter's. I love the blues and greens. Red with fall tones, which have been really popular this season. All blacks and grays. This one was born when I bought the black stripey sweaters. 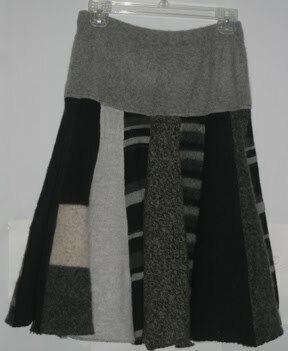 A lot of folks have asked how long it takes me to make a skirt. 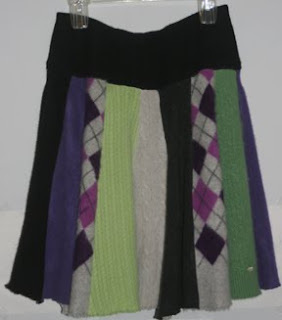 I've never known, because I always cut a lot of sweaters into pieces for skirts, mittens, hats, pot holders, and collect the pieces till I have enough. I did this earlier this week with a huge pile of fall-colors sweaters. I've sewn one skirt from them, and have 2 more pinned, and more pieces that will go into future skirts, as well as some mittens and hats. 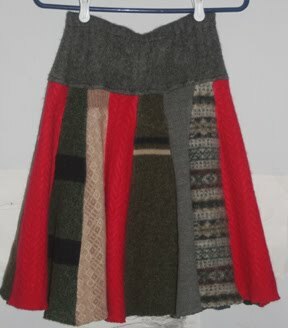 Today, however, I really wanted to make the above black skirt, and just about all the pieces I cut are skirt pieces. With the cutting and sewing, I'd say I spent about 5 hours. I have enough pieces to make another skirt the same size, and a bunch for smaller skirts (all the ones above are adult skirts). So there. A skirt takes me about 4-1/2 to 5 hours, not counting the shopping for the sweaters, and the felting and drying, which are done in batches, so it would be hard to count that time. I guess we could say 6 hours. It's a good thing I enjoy it! Beautiful collection! 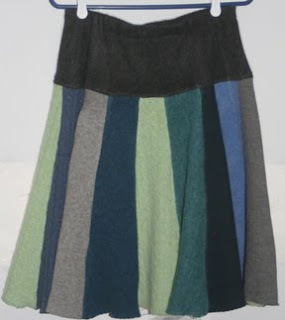 I like winter's blue green skirt among all. I would like to have made the same for me.